I participated in a Holiday Open House at my friend Doreen's. She invited friends who vend: Avon, Gold Canyon Candles, Creative Memories, Homemade Gourmet, and she herself sells Silpada Jewelry. 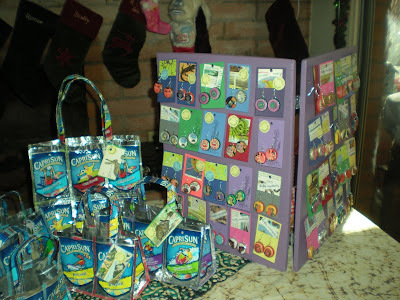 I set up a display of bottle cap earrings and Capri Sun pouch purses. 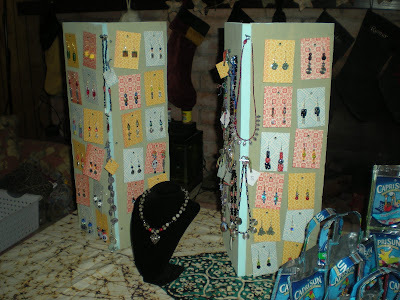 Mandy set up next to me with her beaded earrings and necklaces. I've never seen anyone with the same design aesthetic as my sister. I love it. I participated with inflated expectations. 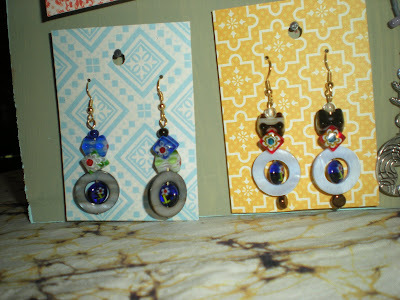 On Friday I sold a dozen pairs of earrings to colleagues and parents at the preschool who'd requested to see my stuff. And I've had preorders for 10 Capri Sun totes from two different people. My coworker Terry, who carries one of my totes as a handbag, claims people ask her all the time where she got it, how much, where can I get one? People appreciate my stuff! They want to buy it! As I left the house on Saturday to drive to Doreen's, I said to Dave, "I'll be back...$300 richer." I came back six bucks in the hole. I made $45 dollars (sold a half dozen pairs of earrings and 1 mid-size tote). 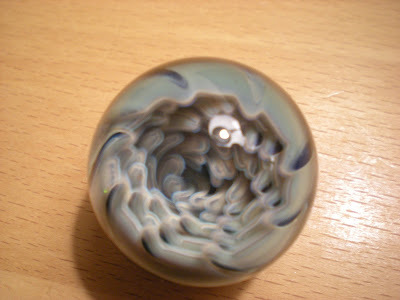 But I bought a blown glass marble from glass artist Calvin Mickle for $40 and still don't regret it, though Dave and Jack laughed themselves silly at me. And I pitched in $11 for horse doovers, of which I ate very few because they were all cookies. So I have mixed feelings about the experience. Though attendees seemed to love my creations, sales were disappointing. I love making the bags and jewelry, but I wonder if it will ever be profitable, even marginally. I still love my marble. And I scored the pair on the right from Mandy. Love at first sight. Sorry, Becky. You might remember how The disappointment of my nearly nothing sales at that bazaar 5 or 6 years kind of turned me off from making jewelry all together. People tell you how great your stuff is but I think to really make anything you have to go to lots of venues. I love yours and Mandy's things. Don't give up. I love you stuff. Your displays looked nice. I've seen some of your bottlecap earring on FB but didn't know that Mandy made beaded necklaces and earring. Very nice. Wish I could have been there. i'd buy some stuff. I would have bought that cloudy gray marble too. Hey - you sold 6 or 7 things! That's great. I don't do sales like this myself because they can be so hard - I'd call your results a success. Enjoy your time with the new kitty.